It’s a dog’s breakfast. It’s a dog’s dinner. What lovely phrases. Figures of speech that I think are a delight to use, provided of course that you’re not involved. So where do they come from and what do they mean? Animals figure prominently in many expressions. A kettle of fish, the cat’s whiskers, pearls before swine, the cat that got the cream, a fly in the ointment, the bee’s knees, a pig in a poke, a nest of vipers. Dog expressions for some reason are particularly numerous: gone to the dogs, why keep a dog and bark yourself, in the doghouse, it’s a dog’s life, a shaggy dog story, the tail wagging the dog, every dog has its day. ‘It’s a dog’s breakfast’ means a complete mess – something or someone that ​looks ​extremely ​untidy. Or a muddle, a shambles or a botch – something that is very ​badly done – as in ‘we’ve made a real dog’s breakfast of it’. There’s a few other phrases that mean much the same: a pig’s ear, a hodgepodge, a mare’s nest. It’s a 20th century phrase that was first cited in the 1937 edition of Eric Partridge’s A Dictionary of Slang and Unconventional English as ‘a mess: low Glasgow (1934)’. 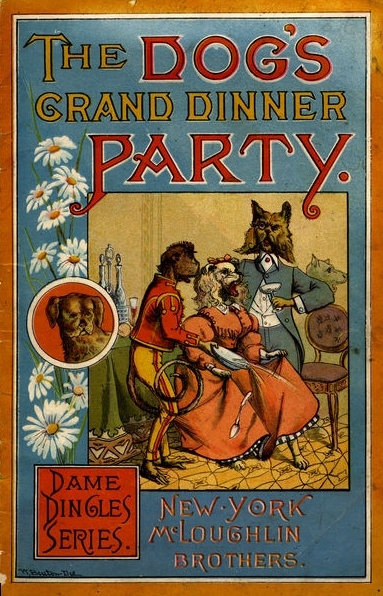 The reference to a dog and breakfast suggests that the phrase had something to do with a cooking calamity: a half-cooked omelette, watery porridge, burnt sausages. Couple this with the notion that a dog will eat anything – though dog lovers would not be amused at this idea – and you have the phrase. But nowadays, whatever its origins, this figure of speech covers much more: a badly planned party or meeting, instructions that are incomprehensible, a do-it-yourself disaster. 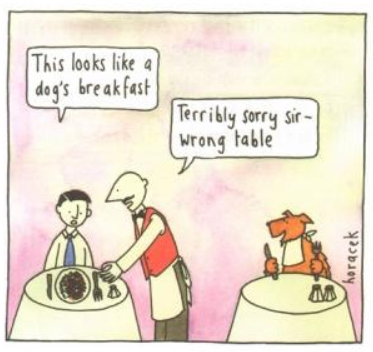 There is a similar phrase ‘a dog’s dinner’ which many online references say means the same as ‘a dog’s breakfast’; that it is used interchangeably to mean a mess or a muddle. 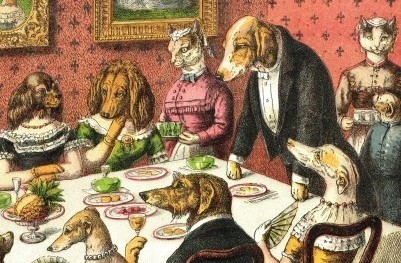 But the full phrase is ‘dressed up like a dog’s dinner’, or ‘done up like a dog’s dinner’, meaning to wear ridiculously smart or extravagant clothes, clothes which are inappropriate for the occasion: ‘My mum really embarrasses me, she always dresses like a dog’s dinner, even when we’re just going to the shops!’. It’s a fairly negative way to describe someone, and it would be more polite to say someone was ‘overdressed’. It is also used to express surprise what someone dresses in an unexpected way. If you were a man used to wearing a morning suit or white tie in the evenings you might not think twice about what you looked like. But if you usually wore more casual clothes: jeans, open neck shirts, trainers, then putting on a business suit and tie – even if it was necessary for an interview or a formal occasion – might draw comments from family or friends that you were ‘dressed up like a dog’s dinner’. It’s not clear how two similar phrases have completely different meanings, at least when ‘dressed up like’ is added to ‘a dog’s dinner’. How is being dressed up likened to a dog’s dinner? It is said to refer to the stiff collars that were the height of male fashion in the 1890s and which actually looked very like dog collars. But where does the dinner come in? Others say that in Medieval England the finest shoes were made of dog skin, and that if you were invited to a castle for a feast you would dress in your finest, and for shoes, you would ‘put on the dog’, meaning shoes made of dog skin. In the full Oxford English Dictionary, ‘to put on the dog’ was ‘to assume pretentious airs’, but did this become ‘dressed up like a dog’s dinner’? At last the day of the grand dinner-party arrived, and the guests all assembled, in good spirits, with keen appetites for the feast. Never had so many sleek, well-dressed dogs met together before, and the variety of their coats and countenances was very striking. Is it possible that these stories somehow gave rise to the phrase? But back to ‘it’s a dog’s breakfast’. I wonder why its origin is said to be ‘low Glasgow’ in 1934? Do any Glaswegians know?